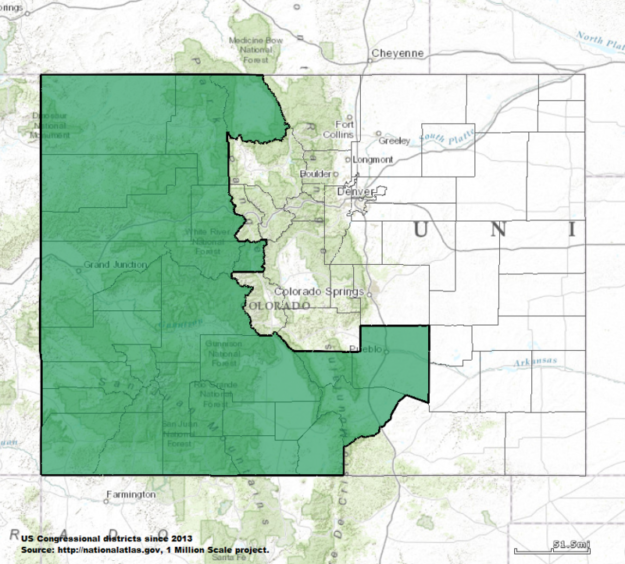 Colorado’s massive 3rd Congressional District (in green), where U.S. Rep. Scott Tipton is facing a challenge from former state Rep. Diane Mitsch Bush. People like to rant about the lack of coverage in their local newspaper these days, as they buy stuff off Craigslist and Amazon – blowing off local businesses that still advertise in newspapers (bless them) – and get all their news off social media spoon fed to them by global tech giants like Facebook, Twitter and Google (some of it actually real and not the product of Russian trolls). While I have for years been one of the ranters, lamenting the days in the early 90s when my hometown newspaper, the Vail Daily, was as fat a phone book and staffed by upwards of a dozen or more editorial folks (at one point I was one of two, maybe even two and half sports writers there! ), the fact is that even free resort-town rags have hit on hard times. Forget about when I used to work at the Rocky Mountain News in Denver and there were literally hundreds of staffers. And then for another 20 years I freelanced for them out of Vail until the venerable metro paper went under in 2009 – a glorious time when papers still had freelance budgets. And also forget about the glory days when Vail had the competing Vail Trail. 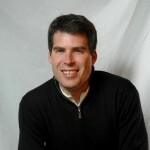 Instead, kudos are now in order for the Vail Daily and its ownership chain Swift – even though I tried to cause them pain back in the day by running the competing Daily Trail – because they have managed to stay afloat, if not actually profitable (although maybe), at a time when real news produced by real reporters is so desperately needed. Furthermore, kudos to Vail Daily Editor Krista Driscoll for setting up an “Elections” section on the newspaper’s website just in time for the critical mid-term Nov. 6, 2018 elections. Yes, this is a bit of self-promotion because you’ll notice that several of the stories in the new section are bylined by yours truly, but the broader point is the Daily is paying attention to statewide politics and even doling out a bit of freelance scratch. This was not always the paper’s custom. I’ve urged Krista to change the section over to “Politics” so stories can continue to be posted there after the Nov. 6 general election. As the new publisher of one of my former freelance outlets – the Colorado Independent – points out, political reporting is in desperately short supply these days in Colorado. And the few sites and papers still covering politics have put their stories up behind pricey paywalls that keep the general public out – a bad trend for democracy. As I’ve written before, I understand needing to make money to pay reporters, but there has to be a better way. Let’s hope the new Colorado Sun and its impressive staff of former Denver Post writers and editors – including Eagle-based reporter Jason Blevins – can figure it out. In the meantime, I’ve found that politicians have adjusted to the new normal of dramatically reduced coverage by in some cases assiduously dodging what little political press there is these days. Some members of Congress will never do a one-on-one phone interview with a reporter. You have to catch them at an event or join a pre-scripted conference call. That’s the case with my own U.S. Rep. Scott Tipton in Colorado’s 3rd Congressional District, which includes the western two-thirds of Eagle County. He’s been in office since 2010 and I’ve only been able to ask him direct questions once or twice on conference calls, while his Democratic opponent, former state Rep. Diane Mitsch Bush, has always been very accessible. U.S. Rep. Jared Polis – who represents the eastern third of Eagle County and is running for governor — has done numerous one-on-one phone interviews with me and met in person. I’ll also never forget the way he stood in there at town halls and took withering criticism during the Tea Party revolution of 2010 – most of it aimed at Obamacare. Case in point, Polis, a sitting Democratic congressman, talked to me directly for this story about public lands. His Republican opponent, Colorado Treasurer Walker Stapleton, provided me with email answers via a campaign spokesman. To be fair, Stapleton was dealing with a political firestorm over the issuing – or lack thereof – of construction bonds, so I’m hoping in the future his access will improve. And his campaign did provide detailed and lengthy written answers. That’s a lot more direct and less nuanced than the answers he provided for my story. I’m not saying this is a partisan issue, because outgoing Democratic Gov. John Hickenlooper has been notoriously careful about his access, while his predecessor, Democratic Gov. Bill Ritter, called me back directly on his cellphone several times. No such luck with Hickenlooper in eight years at governor. The ideal level of access? What I experienced earlier this month with both Republican DA George Brauchler and Democratic attorney Phil Weiser – both of whom are running for the office of state attorney general. Weiser graciously sat with me for an hour at an Avon eatery, while Brauchler called me on his cell and spent a similar amount of time answering questions. I asked them both about the news of the day with the Trump-Russia scandal, and they both provided very revealing answers about the role of a state AG in national political matters. But, more importantly, they both weighed in on a wide variety of state issues, from jobs to healthcare to the environment, and I will roll those stories out in the coming weeks subject by subject. And, of course, access on the campaign trail is quite different from access once in office, but I did do several one-on-one phone interviews with outgoing Republican AG Cynthia Coffman, so I hope either Weiser or Brauchler keeps up the good work on the access front once elected. Again, Stapleton may come around, but so far I’m hearing the same things about his limited personal access from other reporters. Polis remains one of the most accessible politicians I’ve ever met – at least for me – and that matters for the media and for the voting public. Ahead of this week’s Outdoor Retailer Summer Market in Denver, Colorado gubernatorial candidates Walker Stapleton and Jared Polis revealed to RealVail.com their divergent – and sometimes similar — views on the management of federally-owned public lands in Colorado. Stapleton, a Republican and the current state treasurer, made it clear in an email interview via a campaign spokesman that local communities should have the final say on the size of nearby national monuments. The Outdoor Retailer showed moved from Utah to Colorado last year to protest successful efforts by Utah lawmakers to shrink national monuments there. U.S. Rep. Polis, a Democrat who’s represented the state’s 2nd Congressional District since 2009, told RealVail.com in a phone interview late last week that it’s critical for governors to push for the protection of federally-owned public lands to benefit the state’s booming outdoor recreation industry. “It’s very important to have governors of our western state – and of course Colorado – who are strong advocates for protecting our public lands, because our public lands are not only an iconic part of who we are as Coloradans, but they’re also critically important to our economy for the skiing, the hiking, the fishing, the snowmobiling, the hunting,” Polis said. Last year, three Colorado national monuments protected since 1996 under the Antiquities Act by presidential decree were in the crosshairs of possible Trump administration shrinkage after President Donald Trump signed an executive order demanding a U.S. Interior Department review. Ultimately, all three Colorado monuments – including Canyons of the Ancients — avoided the downsizing fate of Bears Ears and Grand Staircase-Escalante in Utah. Polis, on the other hand, says the majority of his congressional constituents in CD2 not only don’t want downsizing but in fact prefer increased federal protections for outdoor recreation, including wilderness designations. “I have a different perspective than a Denver politician would about our public lands because the district I’ve represented for over 10 years is over 60 percent public, so it’s how we manage our public lands for our benefit — for our economy, for access, for sport,” said Polis, a Boulder resident whose district extends along the Continental Divide over onto the Western Slope. Polis, along with Democratic Sen. Michael Bennet, introduced the bicameral Continental Divide Recreation, Wilderness and Camp Hale Legacy Act earlier this year – timing the introduction for the opening of the Outdoor Retailer Snow Show in Denver. That bill has been in the works for many years, starting as the larger, four-county and far more controversial Hidden Gems proposal and then getting pared down to the current two-county (Eagle and Summit) bill that protects 98,621 acres of public lands as wilderness. The bill, which includes unique recreation management areas that won’t close any current motorized access points, also accommodates water, electrical, transportation and even mining infrastructure. It would create the first-ever National Historical Landscape at Camp Hale, and it has a broad spectrum of support from local businesses, governments, water and fire districts. Generally, Stapleton appears to favor multiple use over more restrictive designations that may block mechanized travel or resource extraction on public lands. Despite massive stakeholder input and broad state and local support, Polis said his bill has never even had a hearing before the House Natural Resources Committee chaired by Utah Republican Rep. Rob Bishop, who pushed hard for reduction of national monuments in his state. Mining and oil and gas interests were reportedly behind those efforts. Asked about balancing extractive industries with the needs of the recreation and tourism industries, Polis pointed to the huge job growth in the outdoor sector. “It’s very important as we look at other industries in our state, to say, ‘You know what, not only are our public lands important for us who live here for our fun and enjoyment but they’re also important because there are hundreds of thousands of jobs that rely on protecting our wild areas,’” Polis said, referring to his Keep Colorado Wild plan. According to the Outdoor Industry Association, the recreation sector is responsible for 229,000 jobs in Colorado, generating $28 billion in consumer spending. By comparison, the Colorado Mining Association reports 18,000 mining job and $7 billion toward Colorado GDP, while the Colorado Oil and Gas Association on its website (pdf) shows 2014 job levels of 38,650 workers and nearly $15.8 billion in production value. Both Stapleton and Polis reject ongoing legislative efforts (pdf) by Republican state senators to form a commission to conduct a study “to address the transfer of public lands in Colorado from the federal government to the state in contemplation of Congress turning over the management and control of those public lands to the state.” Such efforts parallel a national effort by state lawmakers across the West to support the 2016 Republican Party platform. Polis said that, if elected governor, he would veto any such state bill if it ever made it to his desk.